Monmouth's Ray Salnave shoots past Penn's Antonio Woods (ground) for the go-ahead basket in the Hawks' overtime win over the Quakers at the Palestra on Monday. The good thing for Penn about playing on New Year’s Eve is that it didn’t leave much time to dwell on what happened at Toledo on Saturday. 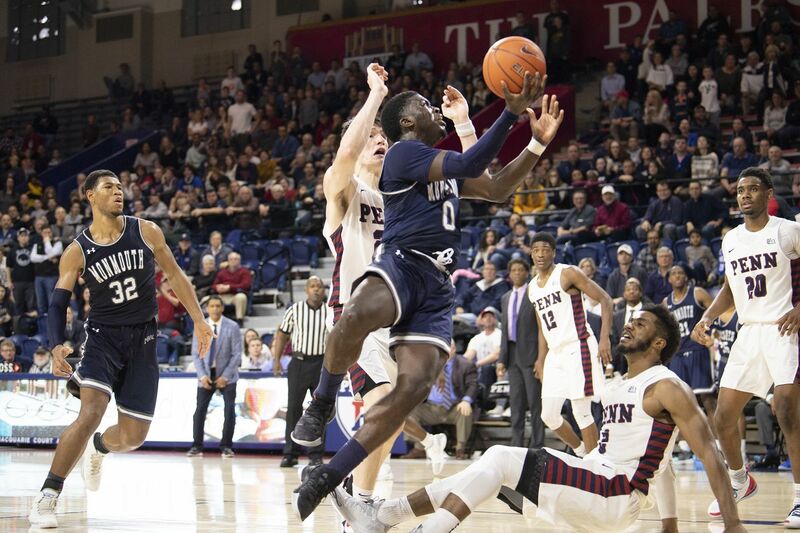 By the time the Quakers got back to 32nd Street on Sunday, the drubbing the Rockets laid on them was old news, and it was time to focus on the game against Monmouth on Monday at the Palestra. A possession-by-possession struggle against the Hawks might not have been what Penn anticipated but, then again, few things are ever a given in college basketball. After a strong start to the season, the Quakers closed on 2018 with a whimper by dropping a 76-74 decision to winless Monmouth in overtime. Ray Salnave made a layup for Monmouth with 2.3 seconds left, and a half-court shot by Penn’s Antonio Woods banged off the rim as the Quakers (10-4) lost for the second time in three days. Woods had a double-double with 19 points and 12 rebounds. AJ Brodeur finished with a game-high 20 points for the Quakers, but missed five free throws in an overtime where the margin was never more than two points. Penn was without Michael Wang and Max Rothschild. “We talk about [free throws],” Penn coach Steve Donahue said. “We work on them. We’ve got to look that part right in the eye and say if we want to win tough, hard-fought games we’ve got to go to the foul line and make shots. After dropping games to Princeton and Yale, Monmouth (1-12) got an Ivy League team for its first win. Last season, the Quakers needed four overtimes to post a win at Monmouth. “Monmouth is a good team,” Donahue said. “People who don’t follow them look at the record. They are going to win a lot more games. I watched the film and saw how physical they were. Antonio Woods notched a double-double but it wasn't enough to beat the Hawks. Monmouth is one of the most generous teams in the nation in surrendering open looks on three-point shots. The Quakers had their share but made just 11 of 34 treys. Now, after a nonconference schedule that included wins over Miami, Villanova and at New Mexico, Penn starts Ivy League play with a back-to-back on Saturday at Princeton and then a week later against the Tigers at the Palestra. “Nothing really matters in our league prior to league season,” Donahue said, “as much as we like to think. What matters [in the nonconference schedule] is that we gain experience and learn what we need to do to improve.